Roseanne Barr made her first public appearance Thursday night since being fired by ABC to tape a live podcast episode at Stand Up NY. Barr addressed an incendiary tweet about former Obama adviser Valerie Jarrett that led to her firing, saying it was meant to be political. She claimed during the taping that ABC was quick to cancel the show because the network long wanted to get rid of her. Roseanne Barr continued to insist Thursday that her inflammatory tweet about former Obama adviser Valerie Jarrett was not racist and said she thinks ABC was quick to cancel her show because the network had long wanted to get rid of her. In her first public appearance since she was fired from the ABC reboot of "Roseanne" following a racist tweet likening Jarrett to a cross between the Muslim Brotherhood and a "Planet of the Apes" actor, Barr sat down with Rabbi Shmuley Boteach for a live podcast taping at Stand Up NY on Manhattan's Upper West Side. Barr, who is Jewish, said her tweet was about asking for accountability from the Obama administration on the Iran deal, which she falsely claimed Jarret authored, "and that was what was in my head." "I'm sorry that anyone thought that was a racist and not a political tweet, because it was in fact a political tweet and not a racist tweet whatsoever," Barr said. "I can talk about it 'til I’m blue in the face and they’re never going to accept it, and I accept that." The 65-year-old also said that she told ABC she was on social media to advocate for Jewish causes and "advance the interests of Israel" — interests she said then-candidate Donald Trump espoused and promised to deliver on if elected. The comedian has been open about voting for Trump in the 2016 election. While taking puffs from an electronic cigarette, a gift from Fox News host Sean Hannity, Barr claimed in the wide-ranging interview she was "bulls-----" into doing the show, but later realized that she and ABC were not on the same page about its direction. "I saw the president of ABC say on the Daily News [the show's] not going to be political at all next season, it's going to be about the family, and I thought 'who the f--- told her that? I didn't," Barr said. She claimed that she told the network her plans for Season 2 included more conversations about race and to hire more black writers, requests ABC "fought every step of the way," Barr alleged. "The day I did that tweet I knew I had lost my show. I knew that they... It wasn’t gonna be my show and what I wanted," Barr said. "I think they had a plan for a long time [to get rid of me] because they canceled it within 40 minutes. Before one advertiser even pulled out. I think they had been thinking, 'Christ she’s a pain in the a-- voting for Trump, being fat.'" Weeks after ABC president Channing Dungey pulled the plug on the popular reboot due to Barr's racist tweet, the network announced it ordered 10 episodes of a spin-off called "The Conners." ABC said Barr relinquished any creative or financial participation in it. 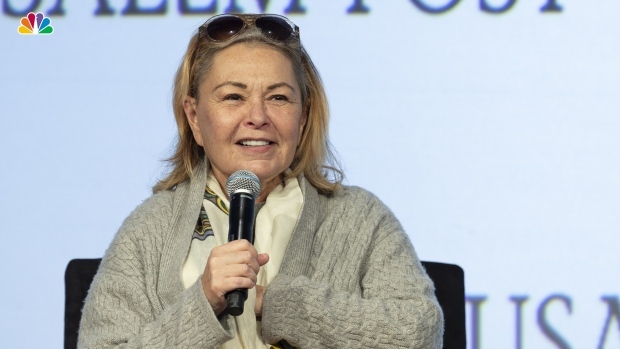 Barr admitted Thursday she has mixed feelings about the "Roseanne" spin-off and said she wishes ABC had called her to clarify the context of her tweet before firing her. "I try to think positively and to afford even those who slander me, I try to treat them with human dignity, despite what they do to me," she said. "I'm sorry that it wasn’t important enough for [ABC] to call me and ask me what I meant." Asked if she thinks the show will succeed without her, Barr told Boteach, "It will be interesting to see a bunch of privileged people who grew up in Hollywood writing for the working class." This is the second time the celebrity rabbi has interviewed Barr. In June, Barr expressed remorse during a live podcast with Boteach saying, "It's really hard to say this but, I didn't mean what they think I meant. And that's what's so painful. But I have to face that it hurt people." Last week, Barr appeared to offer up another apparent apology and explanation, posting a video on her official YouTube channel in which she smoked a cigarette and screamed, "I’m trying to talk about Iran! I’m trying to talk about Valerie Jarrett about the Iran deal. That’s what my tweet was about." "I thought the b---- was white!" she continued, getting even louder. "Goddamnit, I thought the b---- was white. F—!" Later Thursday, Barr appeared on the Fox News show "Hannity," her first television appearance since the cancellation of her television show. During that interview, she said she could have fought ABC over her firing, but that she walked away from the hit reboot because she didn't want anybody to lose their jobs. She said her contract was supposed to allow her to correct any misstatements she made within 24 hours, but she wasn't given the opportunity. Barr's reboot of "Roseanne" debuted with an estimated 18.4 million tuning in more than two decades after the original ended its hit run.